This is time of year people set new goals and resolutions for the New Year. It is also around this week that people start breaking those commitments and goals. The gyms get a little less crowded. Weight starts creeping back on. 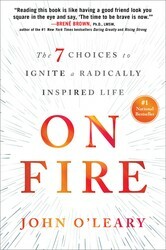 Watch this video from John O’Leary, author of On Fire, for the one tip that will help you make 2016 your best year yet.